Travel between Prince William Sound and Turnagain Arm has always been a vital part of life in Alaska, although modes and routes have continued to change. Chugach Eskimos have hunted and gathered in this area for thousands of years. They trekked over Portage Pass and Portage Glacier to trade and fight with the Athabaskan Indians of Cook Inlet. Many miners and prospectors also used Portage Pass to reach the gold fields of Cook Inlet and the Kenai Peninsula in the late 19th century. Often dropped off at the head of Passage Canal, these adventurers used pack trains, sleds, and pulleys to drag equipment and supplies over Portage Pass in hopes of striking it rich in Cook Inlet or on the Kenai Peninsula. During this period, Portage Glacier still covered most of Portage Lake. Travelers climbed to Portage Pass and traversed the eastern edge of Portage Glacier to Bear Valley. From there they would walk the front of the glacier onto the base of Begich Peak and drop down to Portage Valley. This route, however, was both difficult and dangerous. In 1914 the Alaska Railroad Corporation began to consider ways to construct a railroad spur to what is now the town of Whittier. While railroad manager Otto Ohlson championed this route because of its ability to provide a shortcut to a deep-water port (a trip to Seward added 52 more miles), this route didn’t become a reality until World War II. The main advantages of using Whittier as a rail port was that it was a shorter voyage, reduced exposure of ships to Japanese submarines, reduced the risk of Japanese bombing the port facilities because of the bad weather, and avoided the steep railroad grades required to traverse the Kenai Mountains. In 1941, the U.S. Army began construction of the railroad spur from Whittier to Portage. This line became Alaska’s main supply link for the war effort. Anton Anderson, an Army engineer, headed up the construction. The tunnel currently bears his name. 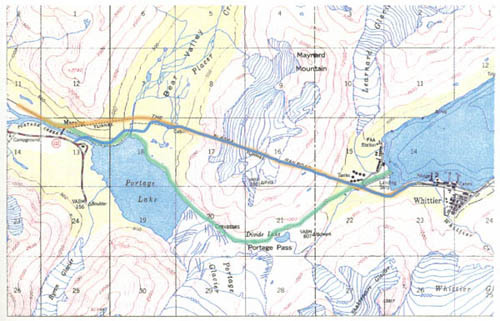 On April 23, 1943 workers completed the spur, which consisted of a 1-mile tunnel through Begich Peak and a 2.5-mile tunnel through Maynard Mountain, thus linking Whittier to the Alaska Railroad’s main line at Portage. With a new rail connection to Whittier, the area began to change. In the mid-1940s, work crews and supply ships began to arrive, and population, including military and civilian personnel, swelled to over 1,000. Infrastructure—such as buildings (including the six story Buckner building and the Begich Tower), a power plant, and a petroleum tank farm—began to change the landscape. The 1950s brought change to Whittier once again. As the military pulled out, Whittier transformed into a federally run commercial port. This turn of events also provided the opportunity for the private ownership and development potential that exists today. Arriving in Whittier meant beautiful views of the marina from the local coffee shop. The best way to keep people out of Whittier is to repeat the mantra, “It is always shittier in Whittier”. After a brief tour of the whole town, we began our hike. It is a short and steep hike. Packs were loaded with boats, lunch, paddles, clothes, and snacks. As we crested the summit our merry band of travelers enjoyed the views and the walk in the mountains. The end of the trail was stunning. We had a quick lesson on how to inflate the boat, wear a dry suit, and try to go in a forward direction. Then we were off. We paddled across the lake until we found the outlet. Then we floated and paddled downstream to where the river meets Turnagain Arm. It was an incredible adventure that made me appreciate the outdoors and Alaska’s beauty even more. We walked across a frozen lake out to a glacier. Just another beautiful day!